NASA's Hubble Space Telescope maintains its orbit around Earth. The space agency hopes to upgrade the aging observatory some time in August 2008. Whenastronauts overhaul the Hubble Space Telescope this summer, they will leavebehind a vastly more powerful orbital observatory to scan the universe. Set tolaunch aboard NASA?s shuttle Atlantis on Aug. 7, the Hubble servicing missionwill be the fifth — and final — sortie to upgradethe aging space telescope. ?We?re notonly going up to Hubble to refurbish it, but also to expand its grasptremendously,? said Alan Stern, associate administrator for NASA's sciencemission directorate, in a recent briefing. ?We expect to make the very bestdiscoveries of the entire two-decade plus Hubble program with the newinstruments to be installed.? In additionto performing vital repairs, astronauts will addtwo new instruments to Hubble?s observation platform — Wide Field Camera-3and the Cosmic Origins Spectrograph — that will drastically boost its visionrange. ?Thisrefurbished Hubble [will be] a new telescope,? said astronomer Sandra Faber ofthe University of California, Santa Cruz. ?We estimate that at the end of thisrepair Hubble will be 90 times more powerful than when it was first launched.? 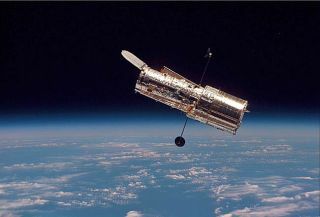 That meansthat Hubble will be able to see at least 90 times more objects in deep spacethan it could when it was deployed in April 1990, she added. With itsability to scan the universe at wavelengths ranging from the near-infrared,visible spectrum to the near-ultraviolet, the new Wide Field Camera-3 shouldallow Hubble to see objects that formed fewer than 800 million years after thebeginning of the universe. ?To followgalaxy formation to times that are even earlier than this, we need a camerathat can take sharp pictures efficiently at longer wavelengths,? Faber said. ?And that?s exactly what Wide Field Camera-3 is going to do.? The newcamera has better resolution than its Wide Field Planetary Camera-2 predecessorand a wider field of view than Hubble?s current NICMOS spectrometer, and couldreveal objects that formed when the universe was just 400 or 500 million yearsold, she added. ?Adifference like this makes a huge difference in the structure and formation ofthe galaxies that we?ll see,? Faber said. Astronomers currently estimate thatthe universe is about 13.7 billion years old. Hubble?snew Cosmic Origins Spectrograph, meanwhile, will scan the universe in theultraviolet range with about 10 times more sensitivity than the observatory?scurrent tools. ?I believeit?s the most sensitive UV spectroscopic capability ever to fly in space forastronomical purposes,? said Hubble senior project scientist David Leckrone ofNASA's Goddard Space Flight Center in Maryland. ?It?s designed, because it?s sosensitive, to go as deep as possible out across the universe as fast aspossible.? Researchershope the new spectrograph will map the so-calledcosmic web, the universe?s large-scale structure made up of strands ofgalaxies that branch out in three dimensions like an astronomical spider?s web. ?It isamazing to me how we?ve been able to reinvent the Hubble Space Telescope witheach of these missions,? said astronaut John Grunsfeld, who will serve as thelead spacewalker for the telescope?s last overhaul. Hubbleservice astronauts will also replace failed gyroscopes, fine guidance sensorand aged batteries, and make unprecedented repairs to the space telescope?smain camera and a vital spectrograph. ?When theastronauts leave Hubble for the last time, it will be at the apex of itscapabilities,? said Leckrone. ?It will be the first time since 1993 that therewill be five working instruments aboard.? Spacewalkerswill replace Hubble?s cracked thermal insulation and replace each of its16-year-old batteries among other hardware. They willalso repair the observatory?s Space Telescope Imaging Spectroscope and theAdvanced Camera for Surveys (ACS), both of which were never designed to befixed in orbit. Spacewalkers will remove more than 111 tiny screws to repairthe two units. ?The goodnews is we?re going to try and repair ACS. The bad news is we?ve never done itbefore,? said Grunsfeld. ?It?s very tricky.? Grunsfeldand his six crewmates plan to stage five spacewalks to service Hubble during their STS-125mission. NASA initially canceled the spaceflight following the 2003 Columbia tragedy, but later reinstated the mission after a detailed risk analysis. The result,researchers said, is about five extra years of science for Hubble before itscontrolled deorbit sometime after 2020. To prepare for the space telescope?seventual demise, spacewalkers will also attach a connecting port that willallow a robotic tug to dock with Hubble. ?None of uscould have imagined what this fourth-generation suite of instruments can do,? saidStern, adding the 90-fold jump in observation power for Hubble will beunprecedented. ?We will have the capability, literally, of approximately 100Hubbles [circa] 1990 when this mission is done. ?